Over the past several months, Contango Oil & Gas Company shareholders have received a steady stream of bad news. The most significant development was the medical leave of absence and subsequent death of Kenneth R. Peak, the company’s founder and longtime Chairman and CEO. Mr. Peak was a unique figure within the oil and gas industry and was often referred to as the “Warren Buffett of oil and gas” based on his plain spoken manner, straight forward management style, and constant attention to the creation of shareholder value. In our limited interactions with Mr. Peak and his management team, it was clear that the company has been run in an unusually shareholder friendly manner. Mr. Peak’s obituary in the Houston Chronicle provides further details regarding his many accomplishments. We wrote about Contango several times over the past four years and published a bullish write-up on the company in September 2012 one month after Mr. Peak’s leave of absence began. We encourage readers to review that write-up prior to proceeding since we will not repeat most of the financial details here. Although Mr. Peak’s illness was obviously serious, we felt confident that the shares continued to provide good value due to the company’s oil and gas reserves, our view of the management succession plan, significant insider buying, and an extremely conservative balance sheet. Unfortunately, several subsequent events have significantly chipped away at each of these pillars of the investment thesis. In this article, we will take a look at the most important changes that have taken place over the past few months and assess whether the shares still represent a conservative commitment of capital. As of the date of the latest 10-K on June 30, 2012, the company reported 257 Bcfe of proved reserves with a PV-10 of $730.2 million. For the quarter ended September 30, 2012, a relatively minor impairment of 2.2 Bcfe was recorded. This was followed by an additional impairment of 20.7 Bcfe for the quarter ended December 31, 2012 bringing the total impairment for the first half of fiscal 2013 to 22.9 Bcfe, or nearly 9 percent of the proved reserves reported to be in place as of June 30, 2012. The company has produced approximately 13 Bcfe over the first half of the fiscal year leaving reported reserves at December 31, 2012 at 221 Bcfe. 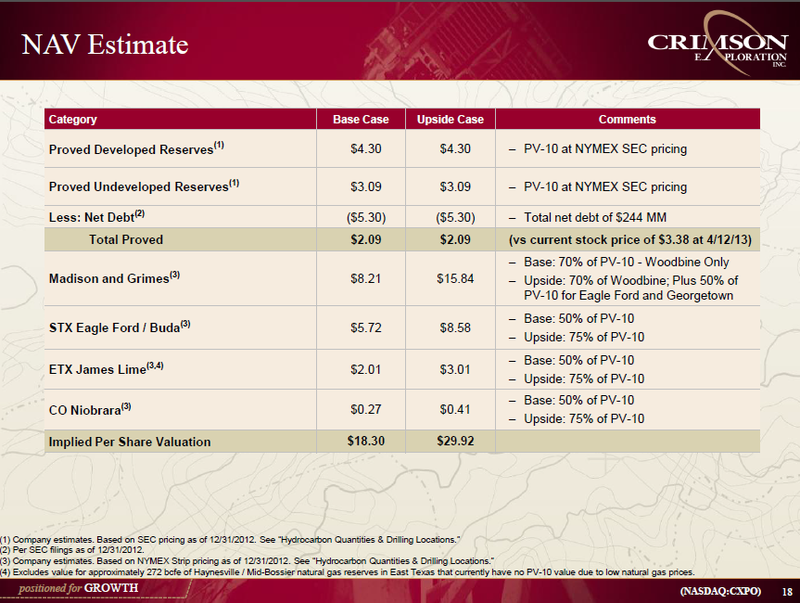 In a presentation announcing the acquisition of Crimson Exploration (more on this later), the company stated that proved reserves as of March 31, 2013 stood at 196 Bcfe and PV-10 was $572 million. The decline from December 31, 2012 clearly signals additional impairments in the latest quarter since production rates cannot fully account for the 25 Bcfe decline. Contango’s next 10-Q, expected to be filed later this week, should provide details on the nature of the latest impairment. The exhibit below shows Contango’s proved reserves on an annual basis since 2000 along with proved reserves as of December 31, 2012 and March 31, 2013. All figures are from the company’s 10-K filings except the figures for December 31, 2012 and March 31, 2013 which come from the company’s latest 10-Q and the Crimson merger presentation respectively. The Company’s reserves and revenues are primarily concentrated in one field. Approximately 89% of our proved reserves are assigned to our Dutch and Mary Rose discoveries which have ten producing well bores concentrated in one reservoir and are producing through two production platforms. Reserve assessments based on only ten well bores in one reservoir are subject to significantly greater risk of being shut-in for a variety of weather, platform and pipeline difficulties. In addition, the risk of a downward revision in our reserve estimates is also greater. Contango has recorded impairments to proved reserves at the Dutch and Mary Rose fields in the past. On June 10, 2010, a 48.5 Bcfe downward revision was announced by the company with Mr. Peak also announcing that he and the management team would receive no bonus payments for the fiscal year as a result. In contrast, it is unfortunate that shareholders had to learn about the reserve impairment in the latest quarter only by being alert enough to draw inferences from a slide during a merger presentation. On April 30, 2013, Contango announced that it would acquire Crimson Exploration in a all-stock transaction in which each share of Crimson would be converted into 0.08288 shares of Contango resulting in Crimson shareholders owning 20.3 percent of the post-merger Contango. The value of the shares to be issued in the transaction was approximately $147 million at the time the deal was announced. In addition, Contango will assume Crimson’s $244 million of debt. Although Contango is clearly the larger company and the acquirer in this transaction, Crimson Exploration’s management will run the combined company once the deal closes. We will not provide a full overview of the merger terms in this article but interested readers can access the merger presentation for a condensed overview and we also recommend reading Crimson’s latest 10-K report. The Crimson acquisition represents a major strategic change for Contango. 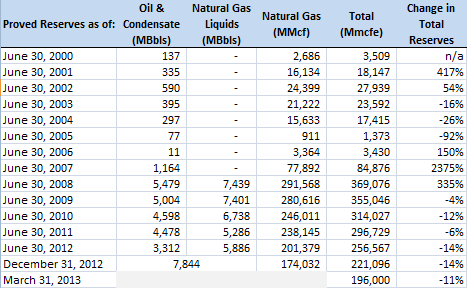 Contango has historically been focused on oil and gas exploration in the Gulf of Mexico and has avoided unconventional shale plays with the exception of a few joint ventures that have not been material to the company’s valuation. Crimson, in contrast, has focused on unconventional onshore oil and gas exploration. As Mr. Peak’s many presentations over the years made clear, the economics of drilling in the Gulf of Mexico have been far more attractive over time because discoveries produce very low cost reserves. We encourage readers to review Mr. Peak’s last presentation given just prior to his medical leave of absence last August. In particular, slide 11 on Gulf of Mexico economics shows how the overall economics of Contango’s historical approach has added low cost profitable reserves for shareholders as evidenced by slide 4 pointing out that Contango’s recent cost per Mcfe was in the $2.68 to $2.86 range — a level that produced profits even in the depressed natural gas market that has prevailed in recent years. In contrast, Crimson’s costs per Mcfe came in at $8.57 for the latest quarter according to a recent press release. Leaving aside the overall economics or valuation for Crimson, it is clear that the operating models of the two companies have been quite different. The rationale for the merger is that the combined company will have a more diversified mix of reserves with Contango’s offshore low cost reserves balanced by Crimson’s unconventional onshore reserves. The strength of the combined balance sheet should also allow more Crimson prospects to be drilled since the limiting factor would no longer be Crimson’s highly leveraged capital structure. Another advantage stated by both management teams is that the risk profile of exploration for the combined company will be lower since riskier offshore exploration will be balanced by onshore exploration with much higher success rates. It should be noted that the strategy outlined in the merger presentation never seemed to appeal to Mr. Peak in the past and he often emphasized the superior economics of a Gulf centric exploration program. Volatility in periodic results did not appear to bother him very much. 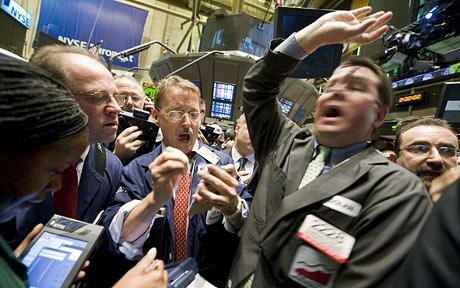 Rather than jumping for joy as Contango shareholders at the great value we are apparently receiving, we instead cringed at the idea that our future management team would feel it appropriate to present a highly promotional estimate of “net asset value” less than two weeks before announcing a deal in which their shareholders would be compensated at a tiny fraction of this figure. Although all of the usual warnings and caveats were presented by management and this probably covers them from a legal standpoint, the ethics of the situation is most troubling. Crimson’s management emphasized the “premium” they were receiving for stockholders during the merger call even though shares had only recently traded above the agreed price and, apparently without any irony, affirmed that Crimson shareholders would be able to benefit from growth in the combined entity since the deal was an all-stock transaction. Of course, the combined company would have to appreciate many-fold to even begin to make up for the low sales price relative to management’s claimed “net asset value”. It should be noted that Crimson’s top management will come out of the transaction in good shape taking over management of the combined entity with attractive employment agreements for the CEO and CFO. All Crimson stock options will also vest and convert to Contango options using the merger exchange ratio. This is very generous treatment for a management team that presided over enormous destruction of shareholder capital at Crimson. Investing in oil and gas exploration companies is always an inherently risky endeavor and Contango was never an exception to this reality of the industry. However, the company had a number of unique attributes that appeared to stack the odds in the investor’s favor. The most important of these attributes included that fact that the company had a history of successful exploration that led to the creation of very low cost reserves in the Gulf of Mexico and had able and honest management in place with a strong shareholder orientation. In addition, the company’s ultra conservative balance sheet made it almost unique in the industry and was attractive for those who did not wish to compound the inherent risks of oil and gas exploration with balance sheet risk associated with a heavy debt load. Unfortunately, most of the underlying pillars upon which our investment thesis was based have been weakened over the past several months. While Mr. Peak’s leave of absence and death was clearly a major negative from the perspective of shareholders, the trend of reserve impairments and the Crimson merger represent even larger warnings signs. Contango’s reserves are concentrated in one field that now has a history of reserve impairment and could face additional impairments in the quarters and years to come. The company has now had two CEOs since Mr. Peak took a medical leave and while we were comfortable with both CEOs and the rest of the management team, we are completely uncomfortable with Crimson’s team which will take over after the merger is complete for the reasons mentioned previously. But Isn’t Contango “Stealing” Crimson a Positive Development? Contango may very well be “stealing” Crimson based on the acquisition price if the proved reserves and reserve potential advertised by Crimson turns out to be accurate and if Contango’s balance sheet can reduce debt service costs and allow for additional drilling of the most promising Crimson prospects. The combined company will have 311 Bcfe of reserves and a PV-10 of $932 million based on the merger disclosures. Pro-forma enterprise value is roughly $900 million and debt as a percentage of total capital should be around 24 percent which is still quite conservative. In addition, the combined company will have about $100 million in tax losses that can be used to offset future taxable income. A case can certainly be made that the risk/reward scenario is compelling for continuing shareholders. The bottom line is that we consider the combined Contango/Crimson entity under the management of Crimson to be a fundamentally different entity than the pre-merger Contango sharing few of its financial qualities and even less of its management philosophy. Therefore the company must be evaluated as if it were a candidate for a new investment. The alternative is to “back in” to the position by default which is always inadvisable. Warren Buffett has on many occasions advised investors to not own a stock for ten minutes if they would not be willing to own it for ten years. With Mr. Peak running the show, Contango clearly passed the test. This did not guarantee results but shareholders were reasonably well assured that the results of their investment would roughly match the change in the company’s intrinsic value over long periods of time. This is manifestly not the case with Crimson’s management team. We are quite sure that Crimson’s management will, in ten years time, be materially richer than they are today. We are equally uncertain about the fate of continuing Contango shareholders and therefore prefer to look elsewhere for investment opportunities. However, the company has for the first time included reserves from the Exaro onshore investment estimated at 19.6 Bcfe resulting in proved reserves estimate of 215.5 Bcfe at 3/31/2013.